Some people—notably the self-proclaimed over achievers among us—find satisfaction in challenges that affirm our acquired abilities in a chosen field of endeavor. There is a comfort to be earned from acing, or at least trying to ace, the final exam in a course of study… even when the course, itself, is an elective. It’s the kind of yearning that sends weekend joggers on pilgrimages to Boston and New York and puts skiers on helicopter flights to the tops of untamed mountains. In moments of total honesty I acknowledge this subjective level of motivation as a big part in my decision to sail a tiny boat across a vast ocean: it appeared to be the ultimate assignment for the aspiring sailor. Yes, surely, there were other attractions inherent in the task… jumping off the 9 to 5 treadmill, the allure of distant lands, immersion in foreign cultures. But those were, in fact, prizes for passing the test. It was the test that truly set the value for the event. To anyone who has never been seized by a similar need to measure himself against his interests, the idea probably sounds shallow and selfish, and maybe it is. I’m certainly the last to judge. After all, I’ve found myself compelled into similar pointless acts in a small airplane, in SCUBA gear, and in a parachute harness. So I was less surprised than anyone when the early months of 2011 found me cramming for yet another final. The time was exactly two years after embarking on my first motorcycle camping trip (Taking to the Road), and there I was, making last-minute plans for my graduate exam in the touring techniques I had worked to develop since that meager beginning. Whereas the March, 2009, venture had called for just three tenting nights away from home while traveling 400 miles through an adjacent state, this magnum opus would be a three-week meander across 3,000 miles, camping my way through six different states… and not in the familiar and comfortable environs of the eastern U.S., either. 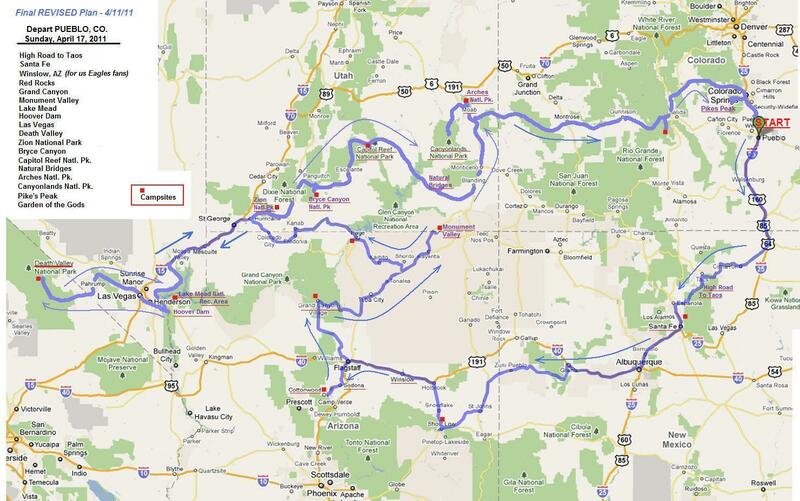 I would put myself on the twisty mountain roads and long, hot desert highways to some of western America’s hallowed landmarks… from Pikes Peak to Death Valley… in Colorado, New Mexico, Arizona, Nevada, California, and Utah. This rideabout was not intended to be a solo undertaking; I actively sought other motorcyclists to join me for all or part of the journey. But one by one my potential companions were claimed by job requirements or family commitments or perhaps just simple reason. My intended start date–in mid-April–was a bit on the optimistic side; spring snows are common until early May at some of my planned destinations. And my one serious encounter with the stuff served as ample proof of how lucky I was in the end. As I say, I didn’t intend to make my ride alone, but the advantages of simple solitude are often underestimated in our gregarious, collective social order. For one thing, options and decisions are easily settled, quickly and unanimously, when you’re a committee of one. 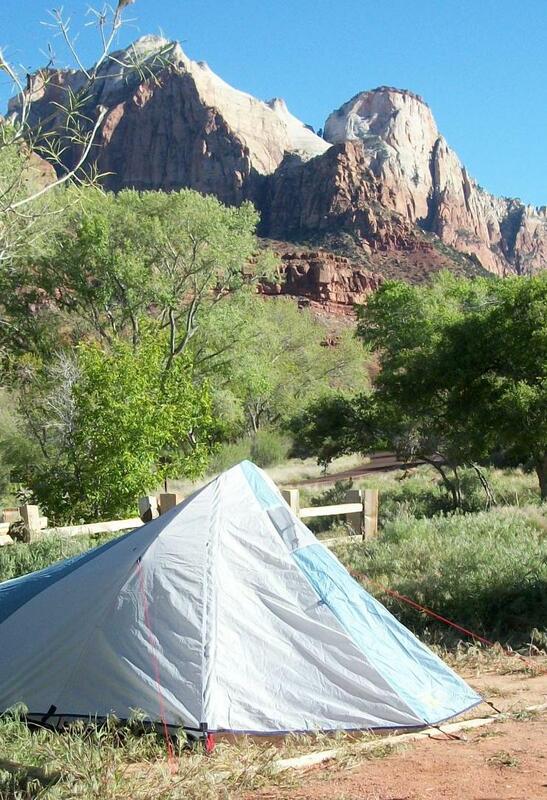 Rest stops, meal breaks, departure schedules, quitting times can turn on a whim. As can the relative merits of competing destinations. I would have found it necessary to link up with another Eagles fan in order to justify my side trip to one Arizona stop, where I just wanted to Take It Easy. "It's a girl, my Lord, in a flat bed Ford..."
In the interest of full disclosure I should point out that it was never my plan to ride my motorcycle from Georgia to California and back again. I didn’t have the time, the money, or the geographic curiosity even to consider it. Therefore, I remain deeply grateful for the generous hospitality of a friend. She provided a base camp in Pueblo, Colorado, from which I could launch a long circle-tour of the southwest. 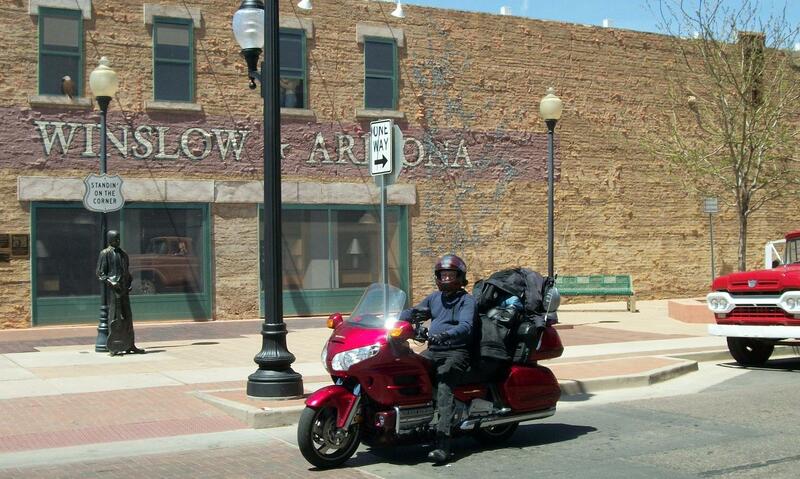 So, for the first 1,500 miles–outbound to Pueblo–the bike and I traveled in relative comfort. The Honda Gold Wing rode on my motorcycle trailer, which I pulled behind my Chevy van through parts of Alabama, Mississippi, Tennessee, Arkansas, Oklahoma, Texas, and New Mexico. We returned–another 1,500 miles–from Colorado to Georgia the same way, but by a more northerly route that included Kansas. The van’s odometer recorded 3,142 miles over a total of five travel days. Interestingly, Scarlet O’Honda’s odometer clocked 3,022 miles during three weeks in the mountains and deserts of the southwest. Getting to and from Colorado accounted for HALF of the 6,000-mile trip. My friend and touring mentor, Bryan Cady (see Smoky Mountain High), was my most reliable resource in charting the course I would follow on my trip. He has ridden the back roads of the southwest many times on long, ad-lib trips to nowhere in particular. It was his vivid tales of the grit and grandeur of the region that caused me to choose this rocky wonderland over another contending destination, the Canadian Maritimes. In the end, a wholly undoable ride that included Mexico and Big Sur, The Golden Gate Bridge and Lake Tahoe, was whittled down to what you see here. I tanked up the Gold Wing and rolled out of Pueblo right on schedule Sunday morning. The sky was clear with some high, wispy cirrus streaks. Temperatures would be in the sixties–ideal for the armored road gear I was wearing. By fortunate coincidence the first hundred miles of my bike ride–southward to Raton, NM–retraced the last hundred miles of my trip in the van. I had seen the terrain and roadscape along I-25, and I knew of the construction work that punctuated the route. What I had not witnessed before–and what caught me totally by surprise–was an important climatological factoid that none of my research and none of my conversations with either Bryan or Mary had prepared me for. Less than twenty miles from the start I was hit by the first of the dangerous crosswinds that plague the vast flatlands of the region’s high mountain plateaus and its low desert floor. On this first day they were gusting to 25 mph and they came with unpredictable irregularity. Though all of them had a predominant westerly vector, the peaks and valleys along my route would redirect them or disperse them or focus them so that each blast came as an unnerving surprise in one way or another. I had started at a comfortable highway speed of 65 to 75 mph. Not long after passing Colorado City I was down to less than 50 just to maintain control of the bike, often at a 10- to 20-degree angle of lean into the wind. With no expectation of this danger, I had designed a pattern for loading my gear and supplies behind me, high on Scarlet’s passenger seat, giving the back of the bike a tall profile in the wind. But the shape and size were still no more than what would be presented by an actual passenger in the seat, and I saw that other motorcyclists, approaching from the opposite direction, whether riding solo or two-up, were equally affected. All of them rode much more slowly than usual and often at a near comical angle of lean into the wind. VIDEO: Click here for a look at the local riding conditions. Yes, for us aging optimists, ignorance really is bliss… at least temporarily. Get more of the Ride of a Late-lifetime on the next page at High Plains Rider. You are such an incredible writer. Thanks for sharing your journey in pieces at the time and for the wonderful saga that you’ve posted.